CLASSICAL LANDS OF THE MEDITERRANEAN. 20 1/4 x 30 5/8" (52.1 x 77.6 cm). Publisher : National Geographic Magazine. Compiled and drawn in the cartographic section of the National Geographic Society for the National geographic Magazine. Gilbert Grosvenor. Editor. Printed by A. Hoen & Co. Baltimore, MD. 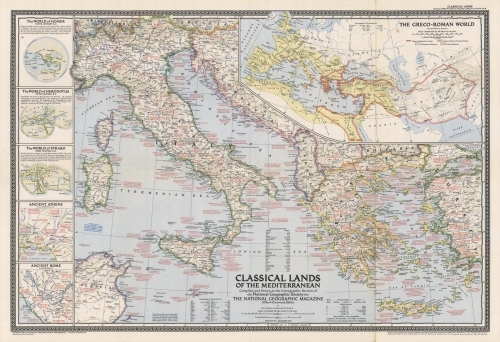 Inset maps include: The Worlds of Homer, The Worlds of Herodotus, The Worlds of Strabo, Ancient Athens, Ancient Rome, and The Greco-Roman World.